Computed tomography (CT) scanning of the head is an x-ray based imaging procedure generating images of the intracranial contents as a result of specific x-ray absorption by the tissues examined (see image below). 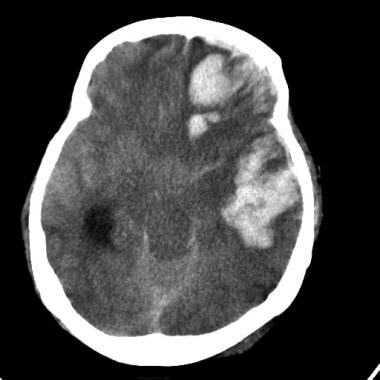 Axial CT scan of the head showing intra cranial hemorrhage. The CT scanner generates multiple sequential cross-sectional images of the brain, and 3-dimensional images of cranium or blood vessels can be created on special software on dedicated workstations, if needed. Depending on the clinical indication, the scan can be performed with or without intravenous contrast injection. It can also be used to guide biopsies. CT scanning is painless, typically noninvasive, and generally accurate. CT scanning has no absolute contraindications. Caution is indicated in pregnant women, particularly during the first trimester to avoid fetal abnormalities. Risk-to-benefit considerations should be evaluated. Repeated x-ray exposure may increase the patient's risk for cancer. However, the risk from any one scan is small, with the benefit of an accurate diagnosis outweighing the risks. In certain clinical situations, intravenous contrast administration is indicated. Contrast media is safe in most patients; however, adverse reactions may range from mild to severe. It is recommended that nursing mothers should wait 24 hours after contrast administration to resume breastfeeding. CT scanning of the head can be performed with a sequential single-slice technique, multislice helical (spiral) protocol, or multidetector multislice algorithm. For CT scans of the brain, the typical slice thickness should not exceed 5 mm. In most circumstances, soft tissue and bony window algorithms should be applied. Window settings should be adjusted manually, when appropriate. The referring physician should obtain CT scanning for only appropriate indications, for answering a specific clinical question, and when no other alternative imaging study is available. Physicians should be familiar with alternative and complementary imaging and diagnostic procedures. All radiologists, medical physicists, radiologic technologists, and supervising physicians should make every effort possible to minimize radiation dose to patients, staff, and society as a whole while maintaining the necessary diagnostic image quality. Imaging facilities should have in place, and should adhere to, policies and procedures that specify protocols tailoring the CT scan to the patient’s body habitus in accordance with ACR guidelines. Safety screens should be in place, with more than one verification, to identify and counsel patients who are or may be pregnant. Similar measures must be in place in order to identify patients at risk for allergic reactions. In most cases, contrast media is typically avoided in patients with medial renal disease. Contrast media must be stored under secure conditions within the temperature range recommended by the manufacturer and administered under sterile conditions. Appropriate emergency equipment and medications must be immediately available to treat adverse contrast reactions, and these should be monitored for inventory and drug expiration dates regularly. If a patient has experienced a prior contrast reaction or has an allergic predisposition or asthma, his or her physician should, when appropriate, consider prescribing medications to reduce the risk of such reactions. The physician should inquire about any history of heart disease, asthma, diabetes, or kidney or thyroid disease. Typically, patients are asked not to eat or drink for a few hours before the procedure, especially if contrast media is to be administered. Any metallic object worn or carried by the patient should be stored away, as it can result in image artifact, degrading the study. Patients should wear comfortable clothing, although they might be given a gown to wear during the test. Female patients should be queried not only at the time of scheduling but also again by the CT technologist just prior to the scan as to whether they are or think they could be pregnant. It also very important for the patient to bring with them any previous radiographs, CT scans, MRIs or other medical images, with reports, for comparison. Imaging protocols and radiations doses should be revisited regularly. A radiation-control quality-control program should be in place at every imaging facility. Every effort should be made to identify and counsel patient who are or may be pregnant. Every effort should be made to identify patients at risk for allergic reactions or have medical renal disease. If the patient has diabetes and is taking metformin (Glucophage), the health care provider should be alerted, as the drug needs to be stopped for a period of time. Patients should be screened for medical renal disease. When performed in accordance with ACR guidelines, CT scanning is a fast, painless, typically noninvasive, and accurate. A trained radiologist reviews and communicates the results to the referring physician, who can then determine the next course of action. The results may eliminate the need for explorative surgery or biopsy. Malatt C, Zawaideh M, Chao C, Hesselink JR, Lee RR, Chen JY. Head computed tomography in the emergency department: a collection of easily missed findings that are life-threatening or life-changing. J Emerg Med. 2014 Dec. 47 (6):646-59. [Medline]. Sheikhbahaei S, Taghipour M, Ahmad R, Fakhry C, Kiess AP, Chung CH, et al. Diagnostic Accuracy of Follow-Up FDG PET or PET/CT in Patients With Head and Neck Cancer After Definitive Treatment: A Systematic Review and Meta-Analysis. AJR Am J Roentgenol. 2015 Sep. 205 (3):629-39. [Medline]. Glass T, Ruddy RM, Alpern ER, Gorelick M, Callahan J, Lee L, et al. Traumatic brain injuries and computed tomography use in pediatric sports participants. Am J Emerg Med. 2015 Jul 6. [Medline]. Mitsunaga MM, Yoon HC. Journal Club: Head CT scans in the emergency department for syncope and dizziness. AJR Am J Roentgenol. 2015 Jan. 204 (1):24-8. [Medline]. Zonfrillo MR, Kim KH, Arbogast KB. Emergency Department Visits and Head Computed Tomography Utilization for Concussion Patients From 2006 to 2011. Acad Emerg Med. 2015 Jul. 22 (7):872-7. [Medline]. American College of Radiology. ACR–ASNR Practice Guideline for the Performance of Computed Tomography (CT) of the Brain. Available at http://www.asnr.org/sites/default/files/guidelines/CT_Brain.pdf. Accessed: March 22, 2013. CT - Head. RadiologyInfo.org. Available at http://www.radiologyinfo.org/en/info.cfm?pg=headct. Accessed: March 22, 2013. FDA. Radiation-Emitting Products. Available at http://www.fda.gov/Radiation-EmittingProducts/RadiationEmittingProductsandProcedures/MedicalImaging/MedicalX-Rays/default.htm. Accessed: March 22, 2013. Picture of a CT scanner machine.